256 pages | 9 B/W Illus. Mobilities research is now centre stage in the social sciences with wide-ranging work that considers the politics underscoring the movements of people and objects, critically examining a world that is ever on the move. At first glance, the words ‘carceral’ and ‘mobilities’ seem to sit uneasily together. This book challenges the assumption that carceral life is characterised by a lack of movement. Carceral Mobilities brings together contributions that speak to contemporary debates across carceral studies and mobilities research, offering fresh insights to both areas by identifying and unpicking the manifold mobilities that shape, and are shaped by, carceral regimes. It features four sections that move the reader through the varying typologies of motion underscoring carceral life: tension; circulation; distribution; and transition. Each mobilities-led section seeks to explore the politics encapsulated in specific regimes of carceral movement. 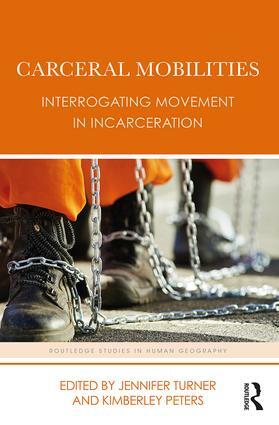 With contributions from leading scholars, and a range of international examples, this book provides an authoritative voice on carceral mobilities from a variety of perspectives, including criminology, sociology, history, cultural theory, human geography, and urban planning. This book offers a first port of call for those examining spaces of detention, asylum, imprisonment, and containment, who are increasingly interested in questions of movement in relation to the management, control, and confinement of populations. Jennifer Turner is a Lecturer in Human Geography at the University of Liverpool, UK. Her research is concerned with spaces, practices, and representations of incarceration, past and present. Jennifer has published widely in the fields of carceral geography and criminology. She is the author of The Prison Boundary: Between Society and Carceral Space (2016). Kimberley Peters is a Lecturer in Human Geography at the University of Liverpool, UK. Kimberley’s research analyses the governance of mobilities at sea. Most recently she has pursued this interest through interrogating the politics of mobilities aboard the prison ship (with Jennifer Turner) and via a study of the formulation of maritime regulatory apparatus (funded by the Leverhulme Trust).